I last set foot in Tenleytown during my junior year of high school, on my way to and from my tour of American University. Since then, I never had reason to return to the far north neighborhood with the cutesy name – until I became curious. So, I grabbed my friend from American, and quickly got the inside scoop on what are the best spots for AU students to frequent. This is the kind of humble, genuine greasy spoon that we could never find in Foggy Bottom – unless it was stripped of sincerity and reincarnated as a yuppie specialty diner serving gourmet hash browns. This shack-like hole-in-the-wall may not be impressive upon first glance, but go inside and sit at one of the few seats at the single long counter. The sweaty server will throw you a menu and grunt at you, and then you can watch your vegetables cut and eggs scrambled from four feet away. 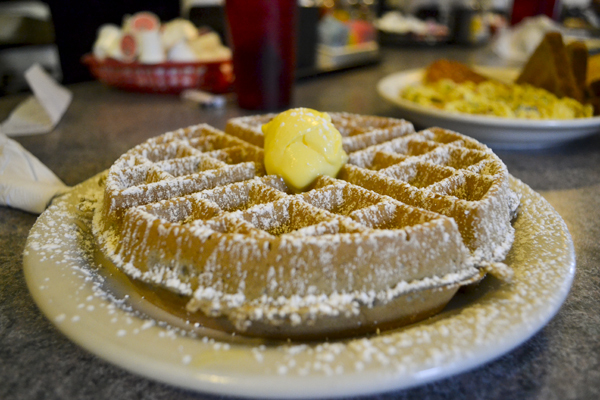 Of course, it’s typical diner fare, but sometimes a simple blueberry waffle covered in confectionary sugar or a fresh veggie and cheese scramble is exactly what is needed among a sea of pretentious brunch purveyors. 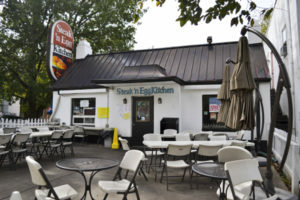 What makes Steak n’ Egg such a favorite among AU students? It never closes. That means 2 a.m. pancakes, all day, everyday. 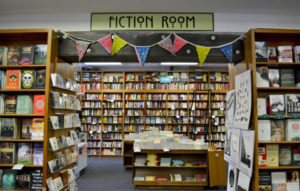 This bookstore is a beloved institution in the D.C. community, and well known for frequent author talks, with over 500 events planned this year. Anyone who even dabbles in the literary world is basically required to speak here. In the last academic year alone, Politics and Prose played host to Michelle Obama and Steven Colbert, among others. For this reason, if you are not already on their mailing list, add yourself to it immediately. I’m planning on making a childhood curiosity a reality when Lemony Snicket stops by on Oct. 17. Thankfully, the bookstore staff eagerly informed me that, yes, this is the type of bookstore where one is welcome to spend the day hibernating among shelves devouring a stack of books without making a purchase. I can tell already that the basement will quickly become my new weekend study spot. It is a cozy room lined with shelves of sale books and a table occupied by students and wannabe authors slaving over laptops. If you need to recharge with food and drink you can walk a few steps over to the bustling Modern Times Coffeehouse. The basic premise of Comet Ping Pong is so gloriously simple you’ll wonder why you didn’t think of it yourself. Combine pizza with ping-pong and you have the perfect date, birthday party or girls’ night. Even the dining tables are painted as ping-pong tables if you can’t wait to play in the back. If somehow this still doesn’t sound like a great night out, add the fact that it hosts live music shows every week. And this month, every Monday at 9 p.m, it screens Halloween movies and cartoons in the back room. Free admission, candy, and $2 PBR- I’ll be there.